The following is a guest post about car insurance fraud. If interested in submitting a guest post, please read my guest posting policy and then contact me. By being aware of common car insurance fraud you can prevent it from happening to you. The last thing you need is a false claim raising your insurance premiums and with fraudsters being incredibly bold it makes perfect sense to arm yourself with inside knowledge of how fraudsters make victims out of unsuspecting motorists. 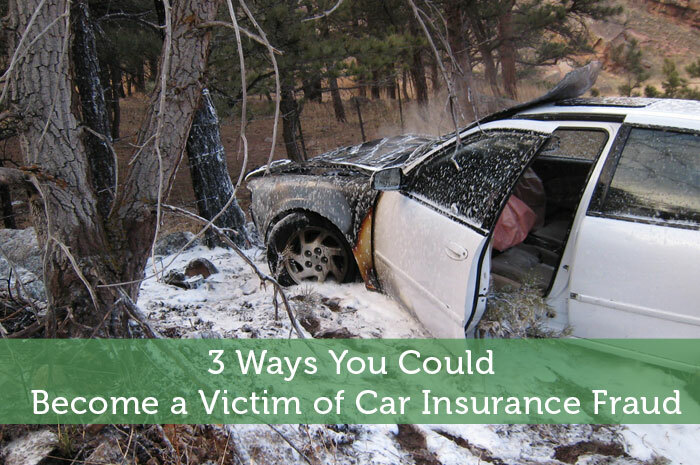 Be prepared and learn how you can avoid being the victim of the 3 most common types of auto insurance fraud. Canadians are not currently aware of the many ways that they can become a victim of insurance fraud. Worst case scenario is that you or your loved ones could be hurt during one of these fraud set ups. It can also result in huge increases in your insurance premiums; do to no fault of your own. Swoop and squat: Set up by two drivers that pull in front of you, the first one slows down and you hit a second fraudster’s car after a sudden break, while driving on the road or highway. Drive Down: You want to back out of a parking spot and you get a flash of head lights telling you that it is okay to back up then your vehicle is hit by a fraudster’s car while driving out from your parking spot. Left Turn: Your vehicle is hit by a fraudster when making a left turn after they have flashed their lights in order to indicate that it is alright to turn in front of them. In all of these scenarios the victim is at fault and the victim’s insurance pays the claim. In both of the last examples you are clearly given the headlight flash to “go for it” and that is their chance to cause an accident. This is a good reason to always allow the other person to go ahead of you. A small restraint and show of patience can go a long way when it comes to fraudsters that are looking to create an organized insurance fraud accident. The previous scenarios will result in an insurance claim, but it gets worst, there are several ways to increase the payout by $2,424 to $29,800 depending on the technique applied by the fraudster. Repair costs: Further damaging the car in the workshop to inflate the repair costs. Rehab costs: Apply for medical rehab treatment for all passengers in fraudster car that can include up to 4 people. Income Benefits: Income replacement benefits for all of the people in the fraudster’s car. All these costs will probably be paid for by your insurance. It can also result in increases of to your car insurance premiums. So beware of insurance fraud and help prevent it! Author Bio: Jon Haver writes at ourinsurancecanada.com where he simplifies the often confusing insurance industry. Since he became a recent parent he has a passion for making sure people have the right coverage and are not just sold whatever is presented to them. Yah it is pretty scary how vulnerable we all are to insurance fraud. This is very true,I remember before my Aunt had an accident just like a swoop and squat. She knew it that it’s like being planned, but to avoid the problem getting worst she just paid the guy immediately. That’s too bad! Hopefully at least no one was hurt. Insurance fraud is a serious issue. The truth is that people need to be more aware of the above ways that you could become a victim. The more awareness drivers have, the quicker society will be able to reduce its impact on the cost of insurance. The fact that this kind of stuff drives up everyone’s insurance can be really frustrating! You couldn’t be more right Jon. A few crooked people are ruining it for everyone! Very informative. I think I just found my next side-hustle! I’ve actually heard of these things being fairly common. My wife just got rear ended and luckily it was an honest mistake from the woman that hit her and wasn’t a scam. Good information. I didn’t know someone has the guts to do those and harm other people. It really is great to be well-informed. Great article John! I had no idea people dared to do that! I am so afraid there would be a CCTV anyway to record the whole thing I’d never try. This sort of thing scares the crap out of me and we were almost caught in it not that long ago. Hubby was caught in the end of a fender-bender (we’re talking so mild that our vehicle didn’t even have a scratch on it. The car in front of him SLAMMED on their brakes to prevent nailing the other vehicle which seemed to have stopped for no reason…LONG story short the guy he ”hit” tried to claim so much BS on our insurance it was insane (stuff like overtime for work) again, there was zero marks on our car but he had a 20 year old beat up piece of crap and no insurance…oh, he also tried to tell the cops my husband was talking on his cell phone (which is illegal here in NS) but our entire vehicle is Bluetooth…. Very informative article. Good research! This would be a great help to your readers to be aware of car insurance fraud and be careful on what insurance to apply. My mother has always told me to ignore people who tell you to go ahead through flashing lights or a wave. Now I see that once again, she is right. I never imagined I could be the victim of a fraudster. This was very eye-opening. Brilliant post and I love the video. I want to point out one issue here. If you indicate that you are giving way or suggesting that it is safe to pass by hand gestures and the third party have an accident as a result you may be liable. For example, if you stopped for a pedestrian it is up to them to cross or not. You shouldn’t do anything to encourage them. You may stop but a motorbike may continue on your side and hit the pedestrian. They still have to check carefully and judge if it is safe for them to pass. You should keep this in mind. A fraudster may manage to get money from your insurer even though they appeared to be giving you way but you may end up in trouble in an opposite case.